The kitchen sink is the centerpiece in a busy home. Deciding on the type of sink to install can leave homeowners baffled by all the options. Here, we have explored the characteristics of two, the stainless steel and porcelain sink, to help you make the best decision for your family. Both types of sinks are available in a variety of sizes and shapes, but only porcelain offers a selection of colors. Nearly any color is available to match your kitchen design. Be aware, however, that a distinct color may hinder efforts to redecorate later on. Also, porcelain sinks have a glossy finish and a certain hominess and style that many homeowners prefer. Kitchens have had porcelain-coated cast iron sinks for centuries, and they are making a comeback in modern homes. They have a timeless quality that brings up warm memories of kitchens past. Stainless steel, on the other hand, can go with nearly any decorating motif. It also has a clean, modern appearance that will go well with up-to-date appliances. The sink will also match future appliances and decorating upgrades. Installation of a stainless steel sink is not difficult for a trained professional. A drop-in sink can be quickly and efficiently installed by a licensed plumber in one to two hours. An undermount sink is more difficult since the cabinet top must be prepared by a countertop installer beforehand. Installing a porcelain sink is the harder of the two installations because of the weight of the sink, often two or three times the weight of the same-sized stainless steel sink. It is also a job better left to professionals. The structure of the cabinet will need to be strong enough to support the weight of the sink. Installation of an undermount porcelain sink will be especially difficult since more supports and braces will be needed. Adding to the difficulty of both types of sinks are additional features that the homeowner may choose. 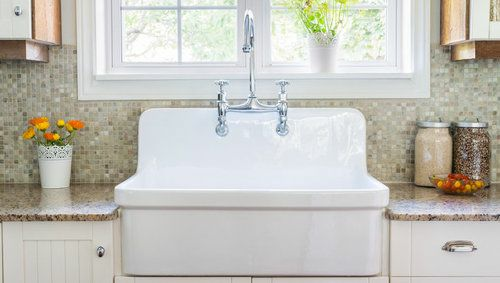 For example, installing a farmhouse design sink will require extra equipment for a garbage disposal because the sink fits lower in the cabinet than a traditional sink. A stainless steel kitchen sink will cost approximately $250 to $350. Drop-in and undermount types do not vary significantly in price. However, if you choose a much higher gauge model or one with custom features like a prep sink area, the cost could easily be $1,500 to $2,500. As an example, for an undermount, 18-gauge, double basin, 32-inch, stainless steel sink, the materials will cost approximately $300. Labor for professional installation will cost about $250. The entire project will cost about $550. A porcelain kitchen sink will cost approximately $300 to $450. Undermount sinks cost between $50 and $150 more than drop-in sinks of the same size and type. A popular style for porcelain sinks is the farmhouse design and will cost about $400 to $600 extra. Color, one of the advantages of the porcelain sink, will raise the price even more, sometimes as much as $200. If you choose a specialty color or custom features like a smart divide option, you could spend as much as $1,500 to $3,000. Undermount, white, double basin, 32-inch, porcelain sink materials will cost approximately $400. Labor for professional installation will cost an additional $250. The entire project will cost about $650. To clean and maintain a stainless steel sink, use only non-abrasive cleaners and materials. For cleaning agents, do not use those with chloride compounds. Also, do not use steel wool to clean the sink. 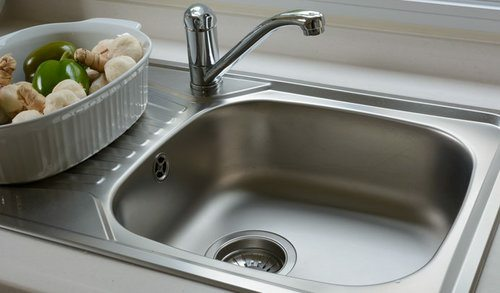 Despite these cautions, a stainless sink is easy to clean and sterilize. This is why hospitals and other medical facilities prefer them. Because they do not get serious scratches or cracks during normal use, you can be assured that they can be sterilized after rinsing raw chicken so that you can clean fresh fruit and vegetables without fear. Stainless steel sinks can be cleaned to have a beautiful shine. This is particularly true if a little lemon juice is added to the cleaner. On the other hand, stainless steel will show water spots between cleanings, and some imperfections will remain if not cleaned quickly. Just as with stainless steel, only non-abrasive cleaners and materials should be used on the porcelain finish. Over time, it may be necessary to have the sink refinished after staining, scratching, or chipping if that damage reaches all the way to the metal beneath the porcelain surface. The finish of a clean porcelain sink will be glossy after a good scrubbing, but food particles can be difficult to remove if they are dried on. On the other hand, you will have no water spotting with a porcelain sink. For the most durable stainless steel sink, manufacturers usually recommend that the homeowner choose one with a lower gauge, meaning a thicker surface. However, a recent Consumer Reports guide differed from that opinion. In their findings, the specific gauge of the 18- to 23-gauge sinks that they tested had no effect on durability. Any of these are highly durable under many conditions. You would have to go to a 14- to 16-gauge sink to see a remarkable difference. It is wise, however, to choose a satin or brushed finish to avoid the inevitable small scratches that normal use will cause. A stainless steel sink is very unlikely to stain, but acids, bleach, and salt can cause pitting if left on the surface for a long period of time. Stainless steel is resistant to heat and most chemicals, which is why they are also the choice of most laboratory sinks. A porcelain sink’s durability is due to its construction. Some sinks are solid porcelain, but the most durable have a steel or cast iron core covered with a baked-on porcelain finish. The key to maintaining that finish is to avoid scratches and chips in the porcelain that might expose the softer porcelain or even the metal beneath. Heavy or sharp objects dropped into the sink can cause this type of damage. Many homeowners use silicon pads or stainless steel racks inside the sink to protect the surface. You must also avoid allowing acidic substances to sit on the porcelain for an extended time since the porcelain stains easily. The nonporous porcelain finish also is resistant to heat. Over time, it may be necessary to have the sink refinished after the sink sustains serious staining, scratching, or chipping. Both types of sinks have a long lifespan. A stainless steel sink will last 15 to 30 years, while a porcelain one will last 25 to 30 years or much longer, with the cast iron core sinks lasting longer than the steel ones. Porcelain sinks can be refinished to last the lifetime of the home itself. Also, the better each sink is maintained and cared for, the longer it will last. In this case, we are referring to the breakage of dishes and especially glasses rather than to the breakage of the sinks themselves. A stainless steel sink is much more forgiving with fragile objects dropped on it than a porcelain sink is. Homeowners often report that they experience more glass breakage with porcelain sinks than with stainless steel ones. Gauge in a stainless steel sink also has little effect on the noise created by running water or dropped objects. The same Consumer Reports testing showed that the quietest stainless steel sinks have a muffling substance applied to the underside and that applied pads were better than sprayed on substances. On the other hand, a porcelain sink will always muffle sound better than stainless steel. Stainless steel sinks are a recyclable material, making them the more environmentally friendly of the two types of sinks. In addition, many sink manufacturers make their sinks from raw recycled material. Porcelain over cast iron can also contain recycled material in the cast iron, sometimes up to 80 percent. Whether a sink is stainless steel or ceramic, the most important element to consider on the resale value of a home is the condition of the sink. A stainless steel sink should be clean and shining. A ceramic one should have a glossy finish with no visible scratches or chips. Since maintaining the appearance of a stainless steel sink is easier with regular cleaning and maintenance, it may be the best choice for future resale value. How much does it cost to install a stainless steel or a porcelain kitchen sink in my city? Cost to install a stainless steel or a porcelain kitchen sink varies greatly by region (and even by zip code). To get free estimates from local contractors, please indicate yours.